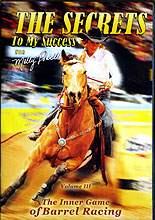 The Secrets of My Success Volumes I and II focused on technique, and now Molly has gathered the help of friends and champions to bring you the ultimate plan for success. Learn the mental stategies for both horse and rider that helped World Champion BullRider Gary Leffew, All American futurity Champion Jockey and NFR Qualifier Tami Purcell, 2x AQHA Trainer of the Year Donna McArthur and Olympic Gold Medalist Molly Powell achieve their success. Enjoy stories and lessons in this entertaining and educational DVD.